Your guide and driver will pick you up from the hotel. Drive to Sanpatong. (*) Continue to Chomthong. First stop today will be the Uthayaan Phra Norn (literally “Park of the Sleeping Monk”). A giant reclining golden Buddha statue is perched on the ridge of a mountain, overlooking the plains. Around the Buddha statue are several other gold statues of monks and abbots. Continue to Hot and onwards to Ob Luang National Park. We will make an easy, relaxing walk to the magnificent Ob Luang Gorge. Enjoy the rock formations and some interesting prehistoric rock paintings. If you want, you can climb up to a great viewpoint. We will have a late lunch at the restaurant near the park entrance. After lunch we will drive to Mae Sariang along a road with beautiful mountain scenery. The rest of the afternoon is free at leisure. You can explore Mae Sariang on own or enjoy a beer (or a shake) at the Mae Sariang Bar overlooking the Yuam River. (*) if departure is on a Saturday we will stop at the huge Saturday market in Sanpatong for half an hour. After breakfast we will start the day with a leisurely bicycle tour through the environs of Mae Sariang. This charming town is set in the midst of forest clad mountains and rice paddies. During our easy bike trip we will pass through typical northern Thai villages and we will stop at a local temple where we will meet one of the monks. Cycle back to the hotel. After freshing up we will depart for Ban Mae La Up. We will stop at several places to enjoy the splendid views. The Lawa or Lua, as the Northern Thai call them, are found only in Thailand. They are the real indigenous people of Thailand and were already living here when the Thais migrated from Southern China. With your guide you will explore the village and meet some of the villagers. We will visit the local silversmith who will give a short demonstration of his craft. Simple lunch in the village. After lunch we will drive back to the main road. Continue to Khun Yuam. 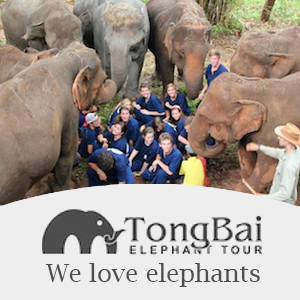 Before arriving in Khun Yuam we will stop at the Tai Yai village Muang Pon. This scenic village has a centuries old monastery, called Wat Muang Pon. We will stop here briefly. Drive to Khun Yuam, a quiet town that most people pass by. After breakfast we will visit the Thai-Japanese Memorial Hall. This museum commemorates the presence of the Imperial Japanese Army during World War 2 but also focuses on the history of the “Tai Yai” of Khun Yuam. Drive to Mae Hong Son. 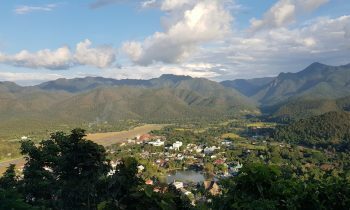 This afternoon, arrive in the small border town of Mae Hong Son, a city with Burmese, Thai and Shan influences. Enjoy a brief tour of this pleasant city, walking around Chong Kham Lake, a park-like setting with beautiful gardens and Buddhist temples. There will be stops to visit Burmese style temples like Wat Chong Klang and the neighboring monastery, and finally Wat Kong Mu, sitting atop a hill just west of town. The temple contains a beautiful image of Buddha carved from alabaster. This morning we will visit the small local market of Mae Hong Son. Board a local boat for an entertaining ride on the Pai River to Baan Piang Din, a settlement of the Long Neck people. Your guide will explain about the situation of these gentle people. Return to Mae Hong Son by boat. Lunch will be at Fern restaurant. After this you will visit some interesting Burmese style Buddhist temples such as Wat Jong Klang and Wat Jong Kham.